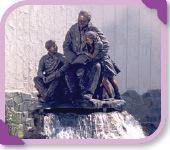 Residents and visitors of the Pioneer Villas will be welcomed by familiar faces — a bronze sculpture depicting a grandfather reading to his two grandchildren. 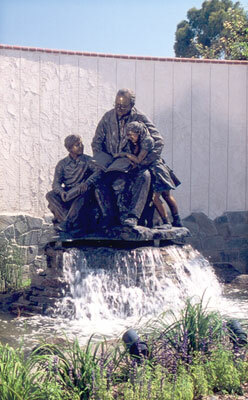 This life-size art piece was set upon a reflecting pool at the corner of Pioneer Boulevard and Eberle Street. “Legacy of Literature,” located at the entrance of the Pioneer Villas, shows an affectionate trio enjoying an afternoon sharing a good book. The bronze sculpture is treated with a patina of burgundy brown and smokey blue-green. Cook is an instructor at the Loveland Academy of Art, Philbrook Museum of Art in Tulsa, the Fechin Institute in Taos and Scottsdale Artists' School in Arizona. Her work can be seen in places across the country, such as Ronald McDonald Houses, churches, libraries, hospitals and World Vision Headquarters in Washington.